The New Mosque is located on the Golden Horn and at the end of the Galata Bridge and can be easily recognized by its two minarets and 66 domes and semi domes arranged in a pyramidal fashion. The main dome is 36 meters high and is supported by four semi domes. A monumental courtyard precedes the mosque on the west side. Ritual purification is performed using water taps on the south wall of the New Mosque. The well-known Spice Bazaar is a large L-shaped market that continues today to serve the people of Istanbul and is part of this attraction. The interior of the mosque uses blue, green and white tiles and there are four large piers that provide the main support for the central dome. Construction began in 1597 and was ordered by Sultana Safiye, wife of Sultan Murad III and Queen Mother of Sultan Mehmed III. The original architect, Davut Aga, began work and was replaced after his death by Dalgic Ahmed Cavus. Construction took over 50 years and was completed by another Queen Mother, Sultana Turhan Hatice. Expense and political disconnect hampered construction and the partially constructed mosque was neglected. Sultana Turhan Hatice took on the completion of the construction as a work of piety, while also constructing the adjacent Spice Bazaar. It was completed in 1663, and inaugurated and opened to the public in 1665. Travelers should be aware that it is courteous to follow the customs in any religious institution upon entrance. Women are advised to bring a scarf to cover the head while inside the mosque. Women and men would do well to dress modestly, covering arms and legs within the mosque. Prior to entrance, there is an area for all visitors to remove shoes and place them on shelves. The New Mosque is beautiful illuminated at night and considered to be less crowded than another popular mosque, the Blue Mosque. If visiting as a tourist and not participating in prayer, try to avoid the prayer times. The call to prayer is 5 times a day and loud ringing throughout Istanbul will announce the times. Visitors can enter the New Mosque daily with opening hours from dawn to dusk. There is no entrance fee but be aware that it will take longer to enter the mosque during prayer times. 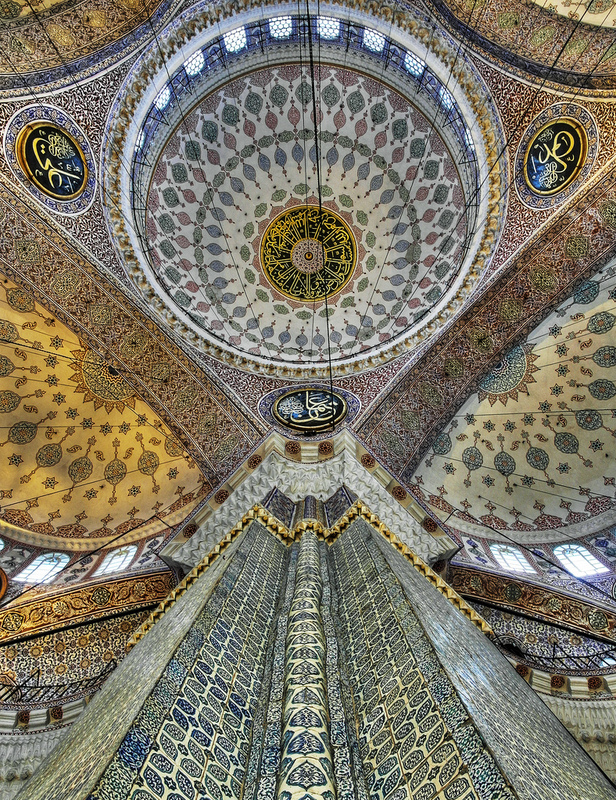 The New Mosque offers visitors a way to glimpse the sacred lives of the people of Istanbul. Its convenient location and associated Spice Bazaar continues to draw visitors and residents today. 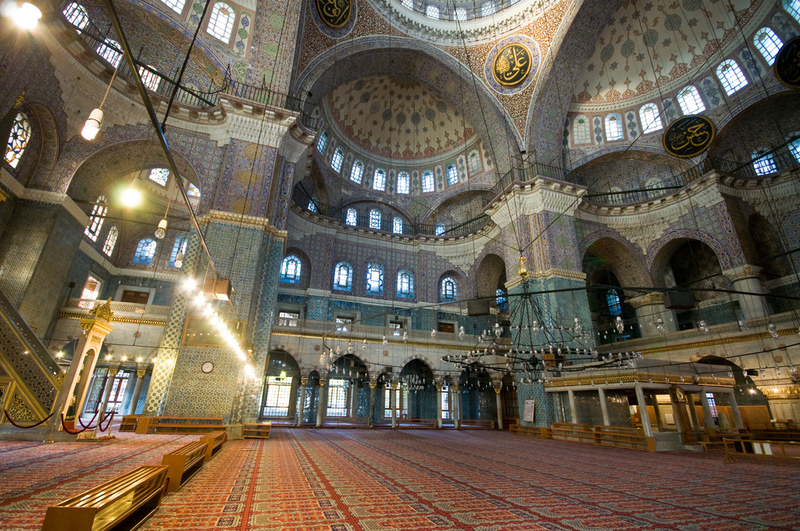 This traditional Ottoman Mosque is a structure of religious and historical importance in Istanbul today. Located conveniently in Sirkeci, just 31 m from Sirkeci Tram Station, Empire Suite Hotel has a restaurant and a sauna. Free Wi-Fi and a 24-hour front desk are available in the property. This luxurious hotel is centrally in Sultanahmet district, surrounded by major cultural landmarks of the old city. The hotel has stylish rooms with free Wi-Fi, next to Basilica Cistern and 80 m from Hagia Sophia.